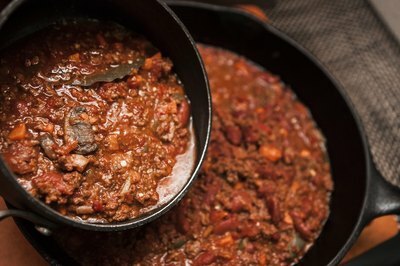 The subtle blend of flavors that produces chili spiced to tingly perfection can be thrown off by anything from mis-proportioned seasonings to tomatoes, onions or peppers that were sweeter than you thought they'd be. 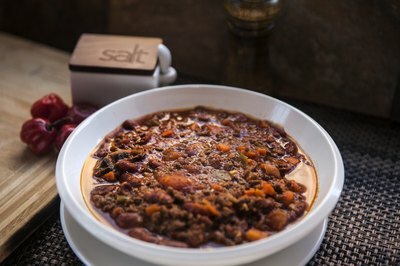 While it's not possible to remove sugar from chili the way you can remove salt from soups or stews by tossing in a raw potato, there are several ways to rebalance the flavors to get the spicy, succulent chili you were aiming for. Salt can balance a dish that is too sweet, but it can also bring out the natural sweetness of some foods. That's why salted caramel is such a treat; salting the caramel both balances and enhances its sweetness. Salting tomatoes and peppers also brings out their sweeter flavors. 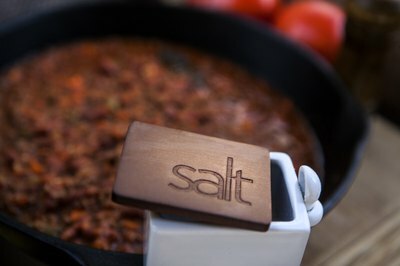 Start by adding 1/8 teaspoon of salt to your chili. Stir it in completely and let the chili simmer for 5 minutes or so. If the chili still tastes too sweet, try another 1/8 teaspoon of salt. If that doesn't balance the sweetness, it might be best to try another method because over-salting will give you too-sweet chili that is now also too salty. The opposite of sweet is sour, so adding a dash of lemon or lime juice or vinegar may be enough to balance out the sugar in your chili. Start with 1/2 teaspoon or so of a tart acid and let the flavors blend for a few minutes before tasting the chili again. Very dry wine may also help, as long as having alcohol in the chili is not an issue. Have another person taste the chili if there's one available because not only do people respond differently to flavors, but stress can alter how you experience them. 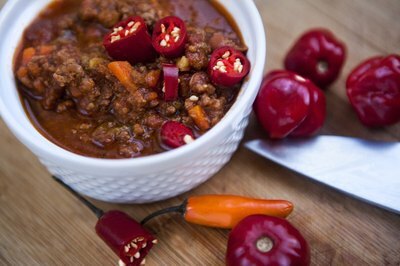 Making the chili a bit spicier should help counteract the sweetness as long as you aren't feeding young children or anyone with a low tolerance for spicy foods. Use a little hot pepper sauce, sliced jalapenos or other chiles, such as serrano if you have them. Red pepper flakes will also work, though most chili powder adds depth rather than heat. Add your chosen remedy in very small measures and let the chili sit for a few minutes for the flavors to develop before adding more. Adding more of the savory ingredients can cut down the sweetness just by changing the proportions of the ingredients. Add more meat if you have it, browning it thoroughly first. Skip the peppers and tomatoes because they can be too sweet. Leave out the onions as well because even though they have a sharp bite when raw, they contain a lot of sugar, and cooking them brings it to the forefront. Fat can also help balance sweetness. Add something creamy and tart such as sour cream, Greek yogurt or creme fraiche to add tanginess and dilute the chili a bit. Add them at the very end of cooking to avoid boiling them, which can cause them to break and take on an unpleasant texture. Because we all experience and enjoy flavors differently, rather than trying to adjust the flavors in the pot, balance the sweetness with savory, spicy or sour toppings. Offer shredded, very sharp cheddar cheese instead of milder colby or Monterey Jack. Put out small bowls of lemon or lime wedges, chopped green onions, sliced jalapenos and sour cream. 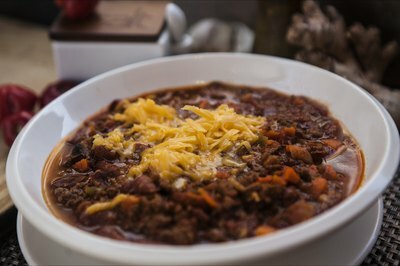 Offer corn tortilla chips to crumble into the chili. 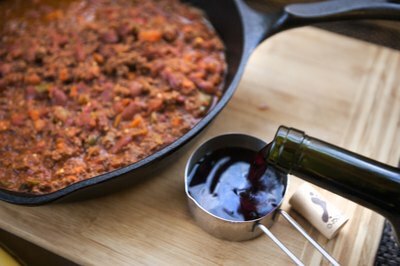 You can also ladle the chili over rice, plain pasta or unsweetened cornbread to help add a savory note. What Do You Do If You Get Too Much Spice in Apple Butter?